Comments: Prince Rupert is a bustling seaport and railroad center. It has all the services necessary for a cruiser. -----El and I stared at the 'planning map' for the Inside Passage while sipping coffee in a café in Fairhaven. We unfolded the accordion wraps until it stretched clear across the room. The far end almost disappeared into the haze of the kitchen. "Wow!" was all I could say. -----"How far is it?" El queried, squinting at the splashes of yellow and blue on the paper. -----I pulled off my belt for a scale, and announced, "Six belt lengths. Let's see, that comes to … ah … about 900 miles." I hastily took a deep draught of coffee and thought it should be laced with Jamieson. "If I remember right, that's about the same distance from New York to Florida." -----"And that's straight-line," El pondered as her finger traced the possible routes suggested on the map. Her finger wandered like she was stirring her coffee as she walked across the room following the squiggly line through the maze of straits, passages, and islands. "Betcha it's well over a thousand - before taking any scenic side passages." 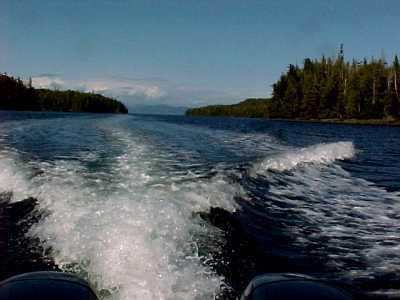 -----That evening, tucked into the shelter of our Alaska camper, we reread the cautions in the cruising guides. It was evident that there were Three Big Dragons on the route north, and myriad smaller ones. -----The first Dragon is the Straits of Georgia, between Vancouver Island and the Mainland, where there are wide stretches open to the prevailing winds. Tides in excess of twenty feet force huge volumes of water through the Strait creating large tidal currents as strong as rivers. 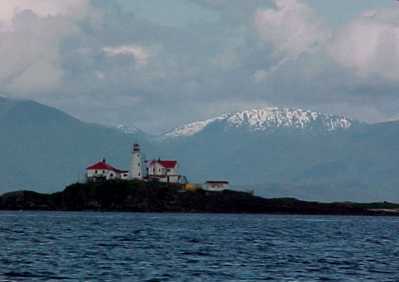 -----The most northerly Dragon is Dixon Entrance, which lies between the Queen Charlotte Islands and the sheltering islands of Southeast Alaska. This strait is also open to the full force of the North Pacific, and vies with the 'Queen's Sound' for tales of terror and death. -----"An idea," El said, sipping her G&T (she says she thinks best with a sundowner in hand). "When we walked the Appalachian Trail, we did a 'flip-flop.' We walked north with the glories of springtime from Georgia to Maryland, caught a train to Maine, and then walked south through the heat of summer in the cool woods of Maine. Walking that half of the trail, southerly, put winter's breath at our back, gave us more leisure, and the delight of the fall woods in New England. Let's 'flip-flop' the Inside Passage." -----"Maybe," I murmured sipping a deeper draught of my beer, "while cruising a boat, we should use a term other than 'flip-flop.' Now, what are you thinking?" -----"Do the two halves as separate entities, each timed most favorably to the weather, as we did the Trail. Let's find out the best seasons for each, and especially when we might catch those Dragons sleeping." ----------1. Find an expert with experience, whose judgment you trust. ----------2. Admit ignorance (especially, admit it to yourself!) and ask questions. ----------3. Keep your mouth shut, and listen to the expert. You only learn when your trap is shut. -----We found the expert, asked questions, and kept our traps shut. We learned from Dusty that the weather is (usually) best in Alaska in the early part of the season, and best in British Columbia/Washington in September/October when storms usually increase in intensity in the north. -----"Perfect," El said that evening. "We avoid two of the Dragons by trailering Halcyon to Prince Rupert. We'll have about 350 miles, airline, between Prince Rupert and Skagway and two months to cruise the myriad islands, coves, and passages between." ----- When our boat was ready, with upgraded equipment and redundant systems for the wilderness cruising, we hitched up and headed north. We crossed the border at Lynden, WA. Expecting an hour or more delay, we had all our papers ready and the boat and camper set for inspection. Three minutes after the cheery "Hi" from the Canadian Customs lady, we were on the way again. "It's the gray hair and smiling faces," El said, "They can tell we aren't the type to rum-run or terrorize." 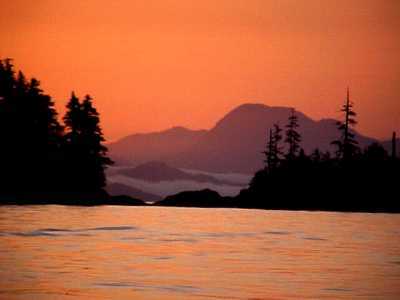 -----One of the most scenic routes on the continent is the road north from Hope to Prince Rupert, via Prince George. The highway tracks a labyrinthine ledge, clinging to the edge of the canyon of the Fraser River. The turbulent water carves a raw slice through the granites of the snow-clad, glaciated peaks of the Coast Range. At Prince George, you cross the divide, and follow the Skeena River back to salt water. Sometimes the two-lane and the railway hug a skinny terrace above the turbulent glacial-swollen waters of the Skeena. Sheer black cliffs rise thousands of feet above the narrow ribbon of road and track. -----We, and Halcyon, twisted our way up the Fraser, over the top, and snaked our way down the Skeena. It was breath taking. -----Our last time along this route was in mid-December, 1999. It was our symbolic last trip of the old Millennium. He were then on the track, having taken the BC Rail from Vancouver to Prince George and VIA Rail onward to the coast. Then the fresh snow and ice lay over the land. We caught the Alaska Ferry north, hop-scotching the towns of Southeast with stays in many of the small winter-bound communities en route. -----Prince Rupert is a rail terminus and major seaport. We were several days in the RV Park, outfitting for the cruise north. The launch ramp for small boats is sandwiched between a fish-packing plant and a commercial harbor. Nearby is a propane facility and there, after launching on the rising tide, we parked our truck and trailer. We thought we would have several days wait at the docks until the weather broke for our trip across Dixon Entrance. -----"Let's go," I said matter-of-factly, as we unhitched Halcyon from the launch ramp dock. "We have the high tide, winds low, and the boat's ready." -----"It's four o'clock - is there enough time?," El queried, the thought of an immediate departure becoming a reality. -----"More than five hours to sundown. We can overnight in Brundige Inlet on Dundas Island, and break up the trip," I said, opening the pre-plotted routes on our chartplotter. "If we find it too rough, we can either return to Rupert or take the 'Mainland Sneak.'" 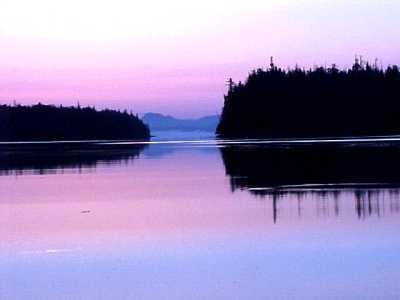 -----That is our term for the shore-hugging route straight north up the eastern shore of Chatham Sound, slipping through passages behind islands, before making a dash across the Portland Inlet. The NE-SW trend of the Inlet invites prevailing winds and is often rough, but this route leads into further sheltered passages to the north. Finally, however, one must 'bite the bullet' at Cape Fox and head westerly into the Dixon. This route, however, shaves off much of the open water and affords numerous harbors for sheltered anchorage. -----"Go for it, Bill," El said, clearing the table of lamp and books. -----We churned through the Venn Passage and out the North Shortcut. It was narrow and winding in the Venn, but well marked with buoys. The reds were to port exiting the harbor and all was well until we were halfway through the shortcut, and out into more open water. As the bow lifted and fell to the ocean swell, I noticed another red, about two miles out. I made a serious navigation error. -----Accustomed to keeping the reds to port, enjoying the scenery, and ignoring the chartplotter, I confidently glided Halcyon ahead. Suddenly we were in kelp. I grabbed the throttles and pulled them back - kelp means shallow, and usually, rocks. Drifting in the swell, I squinted at the sun-washed screen of the chartplotter. Yikes! Red D84 is not a channel marker, but marks the outer limit of a shoal, awash at low tide. We spun and like a puppy with tail between its legs, traced our wake slowly back out until the sounder found 100 feet. -----"Good thing it's near the high," was El's only comment, and she was spot on. -----Brundige Inlet is a 3-mile long indentation into Dundas Island, and a perfectly sheltered anchorage. -----Except for insects, it is ideal - so good that one is uncertain about the sea state in the Dixon outside. 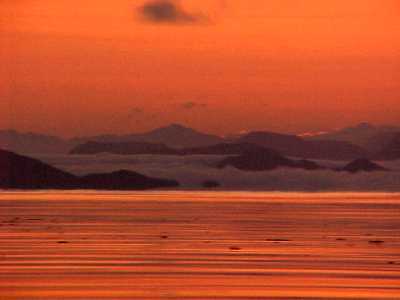 At dawn, which at these summer latitudes means 0330, we crept cautiously out of the Inlet into a beautiful sunrise and calm sea. A few minutes later, our charts showed we had crossed the border, and were in Alaska. Several hours later, we were tying off at a slip in the Ketchikan Yacht Club. We had caught the Dragon sleeping, and were thankful for the good fortune.